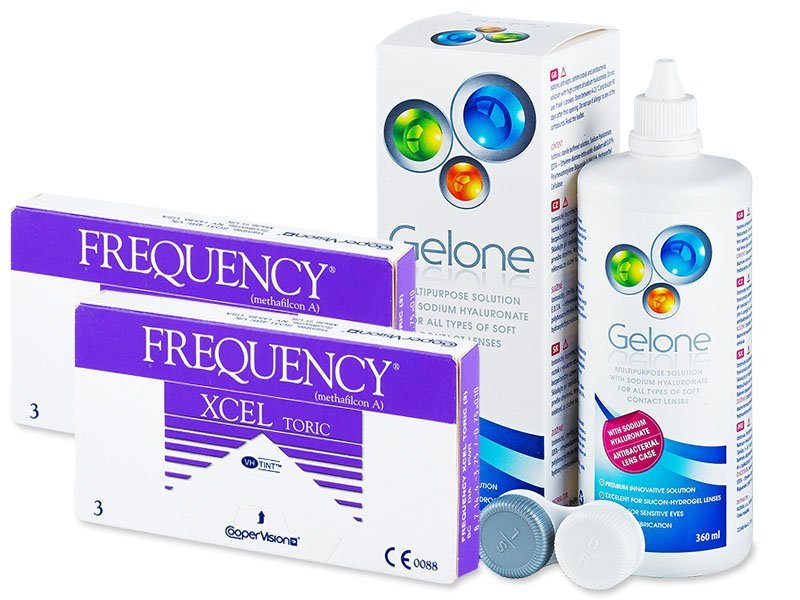 FREQUENCY XCEL TORIC contact lenses correct astigmatism and have a monthly replacement schedule. Their patented UltraSYNC technology ensures all-day comfort. This value package contains a 360 ml bottle of Gelone Solution and an antibacterial lens case. FREQUENCY XCEL TORIC contact lenses by CooperVisionare intended for the correction of astigmatism and have a monthly replacement schedule. The well-designed, thin edges of FREQUENCY XCEL TORIC contact lenses, together with the unique UltraSYNC technology, ensure outstanding comfort. FREQUENCY XCEL TORIC are not designed to be worn while sleeping. Gelone is a multipurpose solution for cleaning and storing all types of soft contact lenses. Thanks to its unique composition, which was created by combining disinfecting ingredients and hyaluronic acid, Gelone solution is an excellent choice for even the most sensitive eyes. The cleaning components of the solution, along with the included antibacterial case with ionisation finish, create an excellent environment for disinfection. Sodium hyaluronate provides flexibility, softness, and moisture for contact lenses and wearers.